Have you noticed that triangle motifs are all the rage, still? I went with the trend for my party Saturday and had accents around the room with triangle prints. If you were there, you may have noticed. But yes, triangles are the new black, perhaps this started with the pendant trend, at least online that seems to be where the whole triangle obsession popped up - when crafty bloggers were showing their triangle-shaped pendants displayed above their desk, party table or stretched across a wall in their living room. Who knows where the triangle madness began but hey, let's roll with it, right? I think the colorful, quirky and fun Clare Nicolson collection of digitally printed interior textiles and accessories fits the trend well - she has a few triangles working their magic on her cushions and I'm loving it. Triangles are aitch.oh.tee HOT! 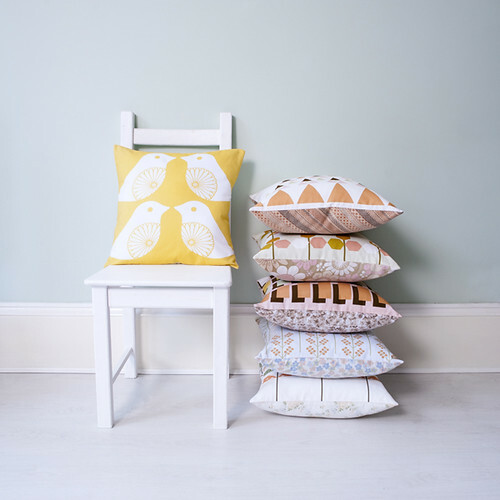 Clare's entire range includes tea towels, stuffed bird pillows, throw cushions, handmade greeting cards and other interior accessories where Clare incorporates vintage fabrics to produce designs that are extra special with a touch of retro granny chic charm. 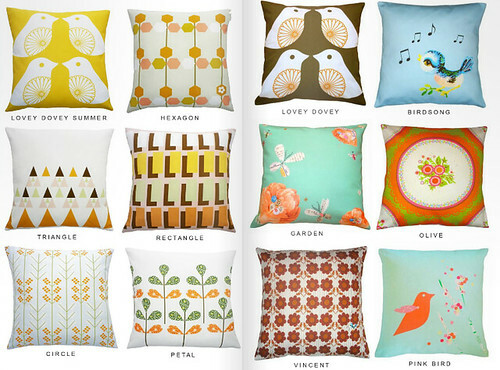 Her line of cushions caught my eye today so I thought I'd share them. They certainly brighten those gray skies! You can see more of Clare's work over at All Things Original - a great online shop featuring loads of sellers and fun products. You can also check out her look book over at Issuu here. So, tell me - are you digging the triangle-as-design-motif trend? I wrote about it over a year ago for an article on Etsy (see it here), but it seems our little polygon friends are surfacing again - stronger than ever!